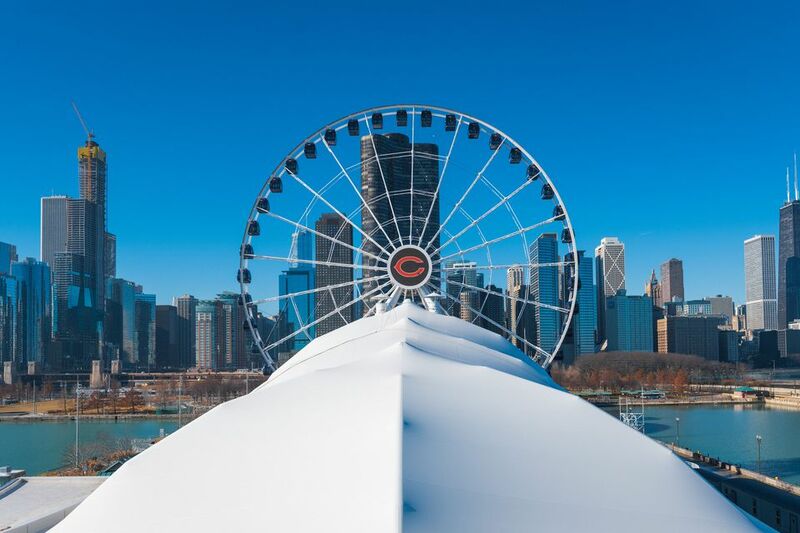 Located just east of downtown on Lake Michigan, Navy Pier offers scores of entertainment and dining options, making it one of Chicago's top tourist attractions, along with Grant Park. CTA bus lines #29 (State Street), #65 (Grand Avenue) and the #66 (Chicago Avenue) all serve Navy Pier. Navy Pier has an on-site parking garage, accommodating 1,600 cars. Parking is a daily flat rate at $20. This 19-acre park enhances the city's lake front, and is a fun entrance to the pier, with its water fountain with computerized jet streams. Many of the city's top boat tours begin and end here. ﻿One of the main areas of Navy Pier, the Family Pavilion is home to the 50,000-square-foot Chicago Children's Museum, an IMAX Theater, the Crystal Gardens indoor botanical park and numerous restaurants and shops. ﻿The South Arcade holds more shops and restaurants as well as Amazing Chicago's Funhouse Maze, the 3-D ride Transporter FX, and the Chicago Shakespeare Theater which, as the name implies, is a permanent home for Shakespeare in Chicago. This popular spot in warmer months features the famous 150-foot-high Ferris wheel, a merry-go-round, a high-flying swing ride and a miniature golf course. The Skyline Stage is also in Navy Pier Park, featuring top music performances from May to September. Festival Hall is the area of Navy Pier dedicated to trade shows and exhibitions. Festival Hall has over 170,000 square feet of exhibit space, 36 meeting rooms, up to 60-foot ceilings, and a full range of telecommunications and electrical needs. Festival Hall is also home to the Smith Museum of Stained Glass Windows, a display of 150 beautiful and historic stained glass. Buckingham Fountain. Made out of gorgeous pink Georgia marble, the real attraction of the fountain is the water, light, and music show that takes place every hour. Controlled by a computer in its underground pump room, it's a dazzling display that makes for a fantastic photo opportunity and a picture perfect background, which is why you'll likely see a wedding party having portraits taken there during milder weather. Island Party Boat. All the party boats are BYOB (bring your own bikini) and BYOD (bring your own dog), and encourage you to really let your hair down. Throughout high boating season, the party cruises occur from May through September. They include the three-hour Aloha cruise with an authentic Hawaiian cuisine on Fridays; three-hour margarita cruise on Thursdays; and two-hour fireworks cruise every Wednesday.